I had today off, but went off to The Hawk Conservancy today and had a very nice relaxing day there, chinese takeaway for tea and have just chilled this evening. However (and onto the subject of the post), I’ve decided that due to time constraints that neither arm will be clad with the ribbed plasti-card. Current thinking is that I’ll ‘edge’ the shoulder blocks with the plastic strip I have – perhaps thicker card on one side than the other. 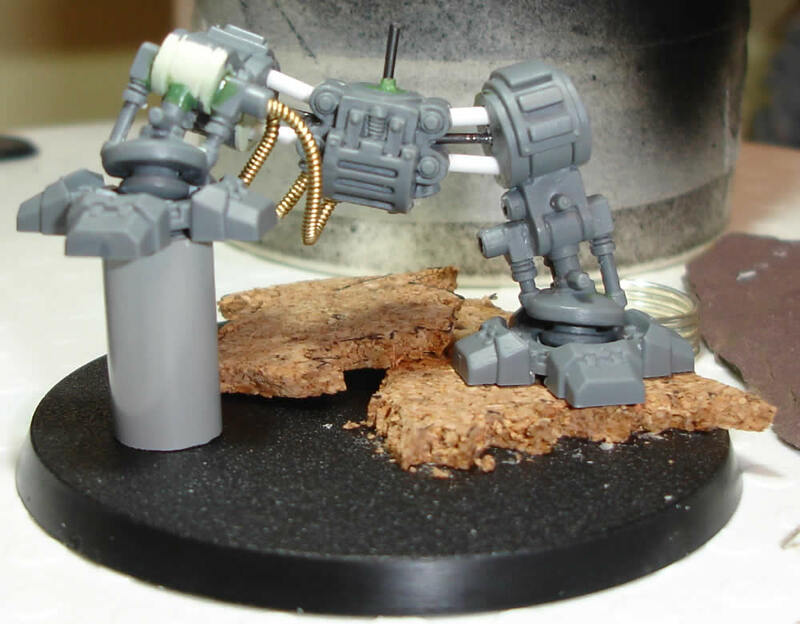 I am still going to do the conversion for the heavy bolter arm though. I’ve also just won a rivet mold – basically you heat up a piece of plastic sprue and ram it into the metal mold. Then when cooled, you cut the rivet off the sprue and glue it on. Not sure how it will work, but £5 is worth a trial. I ordered the bits to make up a Chaos marine last week and these arrived on Thursday. Have just done minor tidying and blue tacked the pieces together to make a mock of the whole Dreadnought. Still needs a lot of work, but personally I think that it’s going to end up being very nice piece. I’ll put the photo of the mock at the bottom of this post. There is a larger gap than I expected around the waist, so a few wolf pelts are going to have to be added to disguise it. 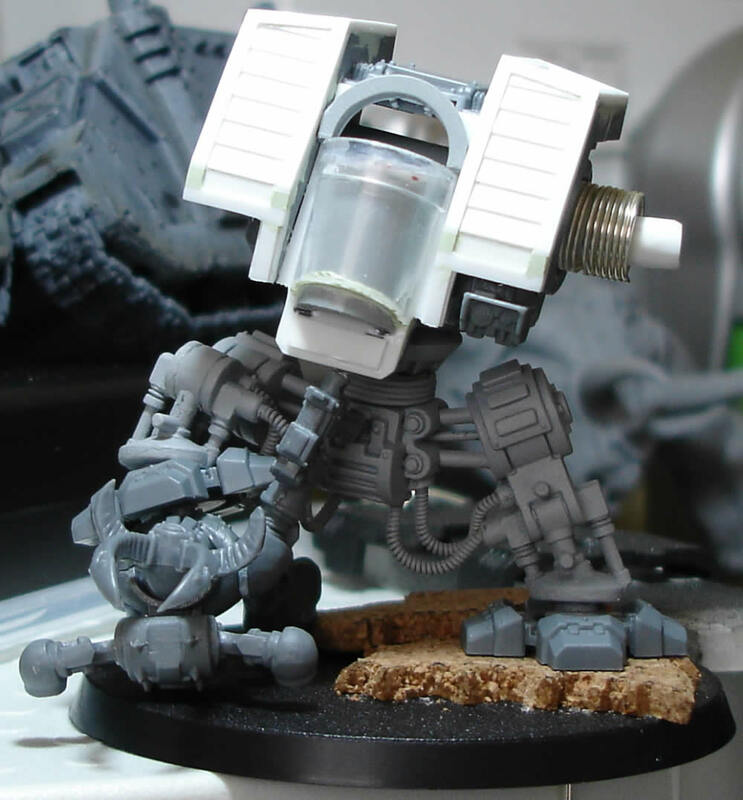 As I said on an earlier post, I’m aiming to have three basic assemblies – the Dreadnought, the giant fur and the base. I’m going to get the Dreadnough torso finished and attached to the legs and then will sculpt the fur again, as I’m not happy with the actual one I’ve done – though the exercise did prove the principal of what I wated to do. Yes that is a tank in the background. By some bizzare quirk of fate, this blog now appears at position number ten in google when you search for the phrase “golden demon 2009”. Quite bizzare to be honest and I have no idea why. This is fantastic as it actually means that I should stand a chance of getting the cloak shape created this weekend. Currently it appears that I potentially have all of tomorrow to do modelling, so I’m going to have to structure my time carefully. Plastic cement dries fully in 4 hours give or take, green stuff can be artificially cured in an hour (actually less, but I like to air on the side of caution), milliput and the milliput/green stuff mix I use, I like to give overnight to dry. Just a short post as I’ve just caught my finger on the edge of my razor saw and it’s chuffing painful.